This month has been the April Showers of Giveaways here at Ally’s Helpful Hints for Mommies!! I appreciate all my friends here and April is a fun month for me since it is my birthday so I wanted to share my fun with you all. Hopefully we can do this every April! Did you know that you can follow Ally’s Helpful Hints on Twitter? Click HERE to start following! Did you know you can follow Ally’s’ Helpful Hints on Facebook? Click HERE to start following! Did you know you can follow Ally’s ‘Helpful Hints on Networked blogs? Click HERE to start following! Did you know you can follow Ally’s Helpful Hints by RSS feed? Click HERE to start following! 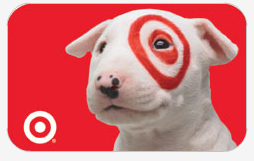 This week we are giving away this $20.00 Target gift card. Just simply fill in the form below with your first and last name and accurate email address. The winner will be notified by email and will have 48 hours to respond or a new winner will be chosen. Giveaway ends Saturday April 30, 2011 at midnight. Winner will be announced on Sunday 5/1 US residents only!